Bartın University Journal of Faculty of Islamic Sciences (e-ISSN 2619-9343) is an online, open-access, free of charge, national and refereed journal which is published by Bartın University Faculty of Islamic Sciences since 2014. The journal has been published electronically since December 2016. Ø The Journal aims to contribute to the field of Religious Sciences and Social Sciences by publishing research articles, review articles, case studies, translation articles, book presentations prepared in academic standards in Religious Sciences and Social Sciences. 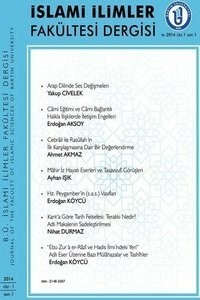 Ø The Journal is written in Turkish, English and Arabic. Ø Submitted manuscripts are first evaluated in terms of writing rules. The works that are found to be written in accordance with these rules are sent two expert referees in the field. If one of the referees reports negatively, a third referee is sent. The two positive reports about the work are published with the decision of the editorial board. The editorial board is free to publish the submitted articles. Published articles can be removed from the broadcast with the decision of the publishing board. Published articles can not be withdrawn without the decision of the editorial board. Ø TDK Writing Guidelines will be based on the writing and punctuation marks of the article (except area specific writings). Ø Articles to be submitted to the journal must be written in accordance with the writing rules of the journal. Ø Articles sent to the journal should not have been published elsewhere, or have not been sent for publication. If the articles are accepted for publication, BÜİFD shall have all broadcasting rights. In case of quoting from published articles, it is obligatory to specify the source. Submitted articles are taken to the publication process after the evaluation of the arbitration committee. Submitted articles will not be returned. No copyright fees are paid to authors.